As Melbourne’s favourite gate fabricators and installers, we have a particular passion for these important structures. They’ve played a vital role in history, and we thought we’d fill you in on some of the most important gates in human history. Anyone that has been to Berlin will have seen this impressive structure. It was built by the Prussian King Frederick William II and finished in 1791. It had borne the brunt of several military conflicts throughout the years but was rebuilt finally just before the Berlin Wall went up in one of the last moment of cooperation between Eastern and Western Europe. Dating back to the Byzantine era this gate has seen some of the most important dates in history. Known as the Gate of Mercy in Hebrew it is the eastern gate on the holy Temple Mount and is tied to both Jewish and Christian history. This gate is composed of five arches and s the southern entrance to Beijing’s famous Forbidden City. It was the place where generals would display their captives to the emperor, and it was the place where Ming and Qing dynasty emperors would review their troops. This beautiful gate was commissioned by Napoleon to celebrate his military victories but wasn’t finished until 1936. 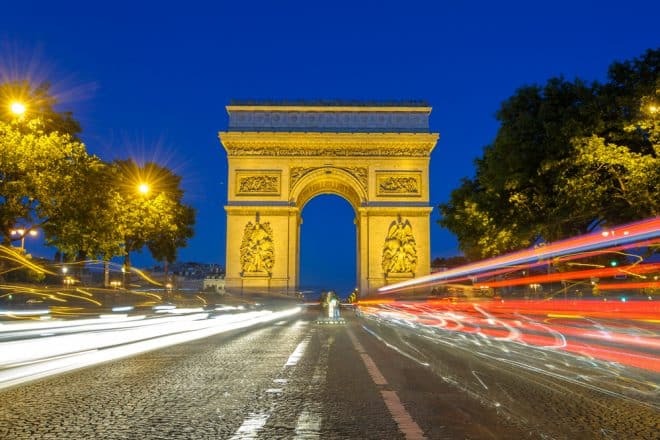 It is a major attraction in Paris and a focal point for French military parades. This is the highest gateway in the world. It is 54 metres high and was built in 1576 AD by Mughal Emperor Akbar to mark his conquer over the Gujarat state in India. A marvel to behold and an incredible example of a gate. Built in memorial to the 82,000 Indian soldiers that died during the fighting of the First World War. Located in New Delhi the top is shaped like a bowl and is used as a vessel for burning oil. Over 13,000 names are inscribed on this marvellous structure. Constructed in 575 BC, this ancient gate featured wall 12 metres high making it a marvel of ancient gate construction. It was excavated over a period of twenty years and can now be viewed in Berlin’s Pergamon Museum. The last arch built by the Roman Empire. It stands 21 metres high and was placed over the route that Roman emperors would use to enter the city after a successful military campaign. Made from granite and standing 19.5 metres high this was built in Madrid in 1599. It has since been demolished and rebuilt and contains four statues that represent prudence, justice, temperance, and fortitude, as well as empty trusses on the western side that represent peace. This is a marvellous gate that was built to commemorate Lisbon’s rise from the rubble of the 1755 Lisbon earthquake. It features beautiful statues that welcome all visitors to the city. It even has a terrace that offers incredible views of the city. Built by Emperor Domitian in 81 AD to honour his dead brother Titus. It honoured the Siege of Jerusalem and became the standard for future arches including the Arc de Triomphe in Paris. The Arc de Triomf was built in Barcelona in 1888. It is the entrance to the Universal Exhibition and is built from brick and reflective of 19th-century Spanish architecture. It features the shields of all 49 Spanish provinces. This is the tallest man-made monument in the Western Hemisphere. The Gateway Arch cost almost 200 million dollars in today’s currency to complete and was completed in 1965. It can be seen from nearly 50 kilometres away. This was funded by the US government and built in 1968 to celebrate Laotian independence from France. It features five towers that honour each Buddhist principle – thoughtful amiability, flexibility, honesty, honour, and prosperity. This one is in the North Korean capital of Pyongyang and was built three metres taller than the one in France. It has various motifs showing North Korea’s independence. Built in 1889 and inspired by the Roman arches, this was built to celebrate the 100th anniversary of George Washington’s inauguration as President of the US. Made of marble, it was one of the key sites in New York City. Feeling inspired by any of these gates. Building an Arc De Triumph out the front of your home might not be allowed under your local zoning laws, but it doesn’t mean you can’t create a gate that celebrates you and your home. Everlast Services can create anything from swinging to sliding gates, as well as double, single and cantilevered options that suit all sorts of properties.